Background: Assessment of the medical students includes theory as well as practical assessment. Traditional practical examination in pathology which includes viva and spots is now increasingly being questioned because of their inherent lack of validity and reliability, time consumption, and human resource requirement. Therefore, a need was felt for another form of practical examination which can be used as formative assessment, and if found feasible, can be employed in summative assessment too. Aim: The aim of the study was to develop and implement a new method of video projected practical examination (VPPE) as a formative assessment tool for MBBS second professional students so as to improve their learning and academic performance in practical pathology and also to obtain students' perception regarding the effectiveness of VPPE. Methodology: The study was carried out with the MBBS second professional students before their end-of-semester examination in the Department of Pathology. In this new method, slide video projection was used as a formative assessment tool during practical examination. Students were randomly divided into two groups. Group I was subjected to VPPE, while simultaneously conventional practical examination was held for Group II. Assessment results of VPPE were compared with conventional practical examination. Faculty and students feedback was also taken at the end of the examination. Results: Mean marks of the students who undertook VPPE was higher than those who gave conventional practical examination. Majority (95.3%) of the students agreed that VPPE is better than conventional practical examination. Most of the faculty members also felt that it is a more valid and reliable assessment tool. Conclusions: Introducing VPPE as a formative assessment tool in practical pathology enhanced their learning and academic performance. Opinion of examiners and students also showed that VPPE has several advantages over conventional practical examination. In medical curriculum, assessment of the medical students is just as important a task as teaching. In pathology, as in other subjects the students are assessed both by theory as well as practical examination. We usually have regular assessments in theory, but periodical practical examinations are rarely held and are also difficult to organize. Therefore, these are much neglected which ultimately reflects in the students' poor performance in final practical examination. Practical examination in pathology includes spots and viva-voice. The traditional oral viva is now increasingly being questioned because of their inherent lack of validity and reliability. Spots also has its disadvantages as it is time consuming and technical issues may occur due to faulty microscope adjustments. Therefore, a need was felt for another form of practical examination which can be used as formative assessment, and if found feasible can be employed in summative assessment too. With this aim in mind, we thought of introducing video projected practical examination (VPPE) as a formative assessment tool which can circumvent the above disadvantages as it will be relatively more objective, structured, and less time consuming. To improve the performance of students in practical pathology by introducing VPPE as a formative assessment tool. To obtain students' perception regarding effectiveness of VPPE. The project was carried out with the MBBS second professional students (4th semester; 2014 batch) before their end-of-semester examination in the Department of Pathology. Permission was taken from the Dean of the Institute and Head of Department to conduct this project. Before administering VPPE, departmental meeting and faculty discussions were held to sensitize the faculty regarding VPPE and also to discuss the blueprint of assessment and its execution plan. Various faculty suggestions were incorporated in the study. After convincing the faculty, VPPE was designed keeping in mind the important must know areas in practical pathology. A mock examination was done with the demonstrators of our department to assess the feasibility, adequacy of 2 min time for each spot, and the best quality of the slides. Subsequently the students were also briefed about this new assessment tool and how it will be conducted and the date for formative assessment was given. In this new method slide video projection was used as a formative assessment tool during practical examination to test the knowledge, comprehension, and problem-solving abilities of 4th semester medical students. The examination was prepared as a computer slide show using a PowerPoint program. It explored all the levels of knowledge, from simple identification to problem solving. The sample frame of this cross-sectional descriptive study was all those students of 2014 batch who were appearing in second professional exam and willing to take part in the study. A total of 86 students constituted the sample size out of 100 students of batch 2014. These students were then randomly divided into Group I and Group II exposed to VPPE and conventional method, respectively, as per standard sampling protocols to avoid selection bias. Since, it was a one time i.e., cross-sectional study, authors were bound not to revisit/approach for the second time as per study design passed by the Institutional Ethical Committee (IEC). Group I was subjected to VPPE while simultaneously conventional practical examination was held for Group II comprising of spots and table viva on instruments, cards, and gross specimens. Feedback collected from the students and faculty was analyzed. Assessment of students' perception was done on the basis of 5-point Likert scale. Faculty feedback on VPPE was also analyzed in a similar manner. A total of 43 (Group I) students of the 4th semester undertook the VPPE in pathology, while rest 43 (Group II) underwent conventional practical examination. There were no major problems at the time of administration of examination. 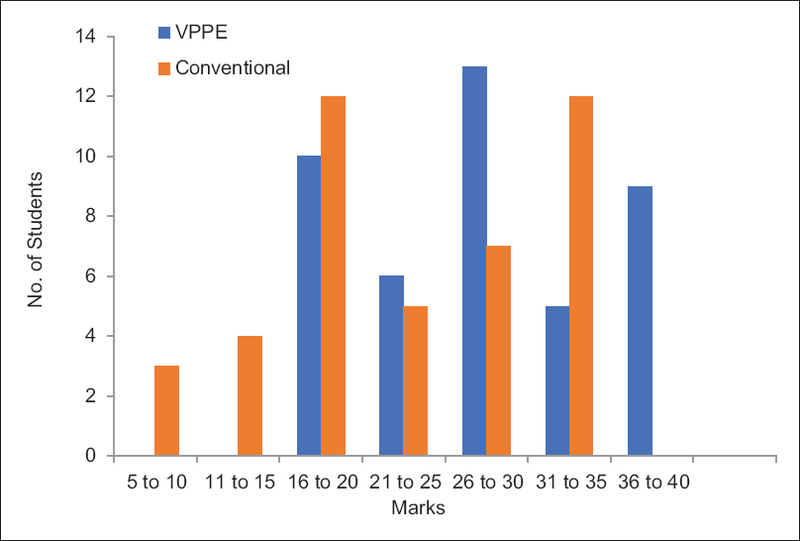 [Figure 1] compares the results of VPPE with the conventional examination. Marks of the students ranged from 16 to 38 in VPPE while they scored 7 to 34 in conventional practical examination. Mean marks scored in each group were 28 in Ist group and 22 in IInd group. Significance of difference between the mean marks of each group was calculated using unpaired t-test. P value was found to be 0.138 which was significant as it was <0.5 [Table 1]. Students' perception of VPPE was also taken with the help of feedback form [Table 2]. All the 43 students returned these forms. Majority (95.3%) of the students agreed that VPPE is better than conventional practical examination while only few commented that there was no difference between these methods. All the students (100%) felt that this type of assessment is fair and unbiased. This method allows wider content coverage and also helps in better preparation for the final examination. Around 93% students agreed that slides were clear and comprehensible and time given for each slide was enough. A total of 88.3% students agreed that slides were relevant to the topic. Only five students (12%) expressed views that although this method was more comfortable and fair, they preferred holding the instruments and the gross specimens in their hands rather than seeing them on screen. Few students recommended this method for future batches too. Only two students i.e., (4.6%) have commented that they had problem with the examination layout and questions were tough. Faculty questionnaire was also given to the faculty members [Table 3]. Percentage of faculty members who returned the questionnaire was 62.5% (5 out of 8) Five-out-of-eight (62.5%) faculty members completed and returned the questionnaires. All of them felt that it is a more valid and reliable assessment tool. One faculty member disagreed that immediate feedback helps in improving students' performance. All of them agreed that it is easier to conduct and organize. Although faculty members were quite impressed with the execution and shorter time period require for conducting it, only one faculty member strongly agreed that they will recommend this method for future batches. Some suggestions which faculty members gave were that VPPE can be conducted periodically at 2 months interval and then can be introduced in the end-of-semester-examinations. However, they were reluctant regarding its implementation for summative assessment. Most of the faculty members i.e., four-out-of-five (80%) had a positive outlook towards VPPE and felt it to be an innovative approach which may result in better learning and consequently better academic performance by students. Various strengths of VPPE as identified by the faculty members were: assessment of large number of students in significantly shorter time, few examiners, objective and structured examination, wider content coverage, less stressful, and reduced examiner bias. However, it is important to accept that this method has its own limitations. Faculty members pointed out various weaknesses of VPPE. It cannot assess students' attitude and face-to-face discussion including assessing higher order thinking skills might not be possible with this method. Visibility of the slides and cheating in the examination was another important concern voiced by the faculty members. On being asked whether this method can be used for summative assessment, three-out-of-five faculty members (60%) were unsure about the idea. Four of the faculty members (80%) raised the concern that since final practical examinations are the university examinations conducted by external practical examiners it might not be possible to implement without university's permission and also external examiners might not be comfortable with this whole concept. Two-out-of-five faulty members (40%) felt it can be done with slight modifications in the format where viva is taken and along with that VPPE may also be conducted in the above mentioned manner. Assessment of learning has been very difficult and time-consuming aspect of medical education. Faculty feedback or the perception of students can be used for a series of reforms in the process of improving the quality of teaching and assessment methods. With this background we thought of assessing our students in practical pathology with a new method so as to provide timely feedback to the students for improving their academic performance in final summative assessment. In this study we investigated the feasibility of using a VPPE for students formative assessment and evaluated how it might affect students' performance. We usually have regular assessments in theory but periodical practical examinations are rarely held and are also difficult to organize. As we all know that theory examinations can be arranged for large number of students at the same time, however, taking regular practical examinations in pathology require a lot of preparation – arranging practical lab, taking out slides, specimens, instruments, faculty for taking viva which again is subjective method with lot of bias. With new medical colleges facing shortage of faculty and increasing number of students it becomes all the more difficult. And only few students can be assessed at the same time in the practical assessment that too in batches. These are some of the reasons that practical assessments are not held regularly, while conducting VPPE was more valid, reliable, and practicable. It saved money and time for both staffs and students. Conventional practical examination in pathology comprises of viva voice, spots, and various hematology and urine exercises. There are usually two table viva in which instruments and hematology cards are asked in one viva and gross specimens are covered in second viva. However, there is lot of limitations with this method especially viva (oral examination). A lot of time is required for conducting viva. Moreover it is very subjective, stressful for the candidates, and there is examiner bias also. Similarly, for spots it is usually conducted in batches of 10 students and is time consuming. There is also problem of faulty microscope adjustments and unintentionally disturbing the focus of microscope resulting in wrong answers by the candidates. A lot of these drawbacks were overcome by employing VPPE for practical assessment in pathology. Till date very few studies have been done on this assessment method. A study was done by El Shallaly and Ali on the use of video projected structured clinical examination (ViPSCE) in the assessment of final year medical students. They found that ViPSCE was fair, less stressful, and more interesting than the oral examination. It covered a broad spectrum of the curriculum and the questions were relevant to clinical practice. They also found that ViPSCE marks for students correlated well with their marks in theory paper and poorly with result of their clinical examination. In our study, mean marks of the students who undertook VPPE was higher than those who gave conventional practical examination. We found in our study that VPPE was superior to conventional practical examination in various respects. Large number of students could be assessed in significantly shorter time. This method was more fair and unbiased. It was easier to administer and more interesting. Similiar advantages were seen with ViPSCE method used by El Shallaly and Ali. Most of the students (79%) were of the opinion that VPPE is better than conventional practical examination. They also thought that it will help in better preparation of the final examination. Small-sample size was a major limitation of this study. To increase the sample size, for this a multi-centric study with more than 1000 subjects will be required and this was the only limitation of the current study. However, the test of significance applied in this limited study shows the significance of the findings as statistically proven also. The result of this study is published so that other medical colleges are also encouraged to take up this study for validation. We however are continuing with this study with other batches too and getting promising results. Another limitation of the study was that in spite of maximum effort there was no uniformity in the type of questions asked in both the groups. As it was a single assessment its exact affect on the final performance of the students could not be assessed. In our study only few students gave negative opinion which was mostly about time given for response and the difficulty level of the questions but none had any reservations or objections to the use of computer/video projection of slides. This was similar to the study by Hochlehnert et al. CBA, also called computer-based testing (CBT), has been used increasingly as an assessment tool in many medical disciplines. A survey of United Kingdom medical schools on the use of computers has shown that CBA has a potential for improving the assessment of physicians and other health professionals by developing more valid examinations. It is generally popular with candidates and efficient in the delivery and marking of tests. Available advances in computer and software technology offer several advantages for the administration and computerized examination in medical education. This study favored use of VPPE as formative assessment tool in pathology. Students who undertook VPPE performed better than those who gave conventional practical examination. It also offered several advantages over conventional examination such as ease of organization, administration, and evaluation along with higher reliability and validity as evident from opinion of faculty and students. This method if found feasible can be applied for summative assessment. With acute shortage of faculty in most of our teaching institutions and increasing number of students VPPE offers an important alternative to traditional practical examination without compromising on the quality of the examination. However, more studies are needed for assessing the feasibility of VPPE before implementing it for summative assessment. We would like to acknowledge the support of faculty, demonstrators, and junior residents of our Department of Pathology, HIMSR for participating in this study. We would like to acknowledge the faculty of ACME, CMC Ludhiana for their support for this work. and Dr. Khursheed Muzammil for statistical analysis. Prideaux D, Young LE, Carroll RG. ABC of learning and teaching in medicine: Curricular design. BMJ 2003;326:268-70. McLean M, Gibbs T. Twelve tips to designing and implementing a learner-centred curriculum: Prevention is better than cure. Med Teach 2010;32:225-30. El Shallaly GH, Ali EA. Use of video-projected structured clinical examination (ViPSCE) instead of the traditional oral (viva) examination in the assessment of final year medical students. Med Educ 2003;37:1048. Hochlehnert A, Brass K, Moeltner A, Juenger J. Does medical students' preference of test format (computer-based vs. paper-based) have an influence on performance? BMC Med Educ 2011;11:89. Cantillon P, Irish B, Sales D. Using computers for assessment in medicine. BMJ 2004;329:606-9.